Except, actually, he was pressed back against the side of a London black cab in broad daylight in one of the most populated tourist areas. Even so, the trapped feeling persisted. The cabbie’s chest was broad and his biceps bulged out from under a tee shirt that had presumably shrunk in the wash. His throat was sinewy, and hair from his chest curled up and over his low neckline. With a further frisson of shock, Eduardo realised he was forced back against a flat surface by a positive bear of a man. Delicious. His libido was liable to wake up and lick its lips, although Eddy would have kicked himself at this inappropriate reaction if he thought his legs could work normally. Instead, his whole body was shaking and he felt more than a tad nauseous. A great story, love the way you developed the story line. 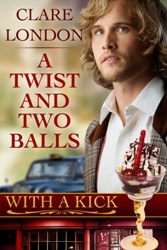 A real fun read and a great light romance. I can see it being a series. I highly recommend this story.